is the ability to move small objects around in your hand without using the other hand to help. There are three parts to In-hand manipulation...translation, shift, and rotation. Translation is using your fingers to moving a little item from your palm to your finger tips (or your fingertips to squirrel the item into the palm). When you hold a coin in your palm and manipulate it to your finger tips to push it into a piggy bank or vending machine, you are demonstrating palm-to-finger translation. Shift is moving an object using the pads of your fingers...adjusting the pencil grip is demonstrating finger shift. Another example might be manipulating a button or a zipper with the finger tips. Rotation is rolling an object using the fingertips. Examples of rotation are rolling a pencil in your fingertips, turning a pencil over to use the eraser, or opening a bottle top by rotating the lid on your finger tips. 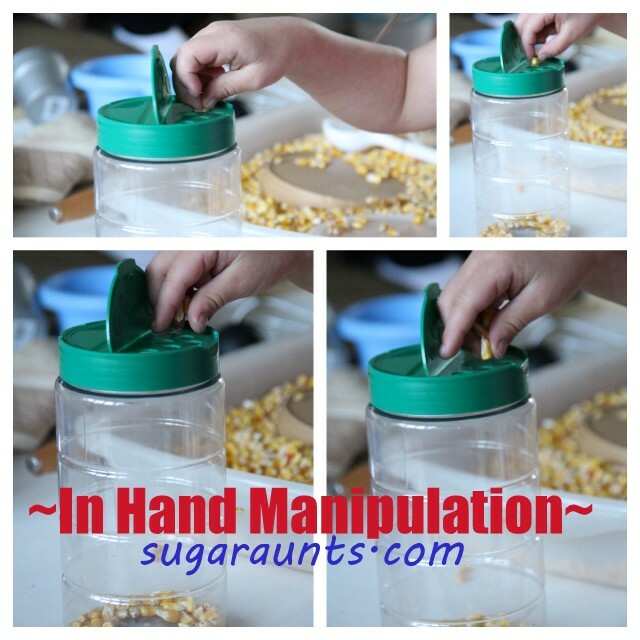 In-Hand Manipulation is a high level fine motor skill and essential for activities like handwriting, buttons, snaps, zippers, cutting, and play. If a child has difficulty with any three aspects of in-hand manipulation, you might see them struggling to perform these tasks, use two hands to do an activity or skill that normally would use just one, appear clumsy. You may see them unnecessarily stabilize their arms against their chests and do a task very close to their bodies. 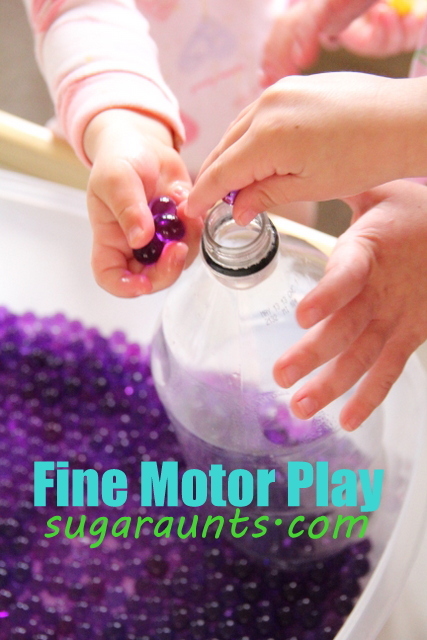 We have done two different (and FUN) play activities recently that work on in-hand manipulation. This first one used our bin of water beads. I put an empty two liter bottle in the bin and the kids went crazy popping the water beads into the opening. You can see Little Guy's hand full of water beads in one of the pictures below. 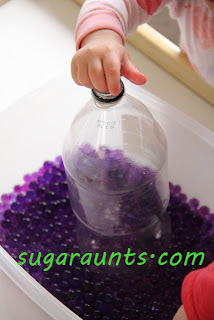 ﻿He was able to hold the water beads in the palm of his hand and move them to the fingertips. He used palm-to-finger in-hand manipulation skills to maneuver the water beads into the opening of the bottle. Baby Girl had a lot of fun doing this activity too. We've been playing with another activity recently that really works the in-hand manipulation skills. We brought an empty grated cheese shaker bottle into our corn bin. Big Sister held a handful of corn kernels in her palm and would place them, one by one, into the holes of the lid. Have your child pick up the kernels one at a time and squirrel them away in their hand before pushing them into the holes of the container. This would be a one way to encourage finger-to-palm translation. You could also encourage tripod grasp if you presented it with a little larger items, like small crafting pom poms, cut bits of straws, little pieces of pipe cleaners...the possibilities are endless! What are some other ways that you can encourage in-hand manipulation? 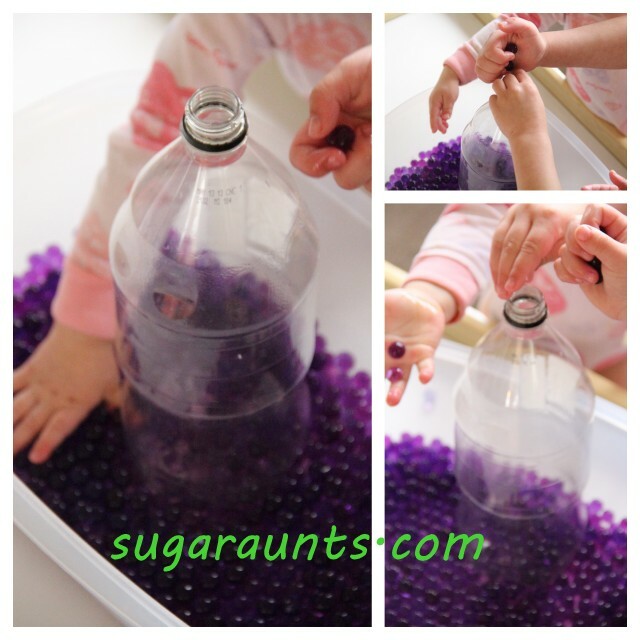 Pick up beads and encourage your child to hold them in their palm as they pick up more.